As it is often said, the Traditional Filipino Street Games are childhood activities past on from one generation to another. But amidst the modern age of technology and mass media, our fellow Filipino's are prone to acculturation with Western culture --- from sports celebrities to movie idols and animation characters. In addition to this, modern technologies has ushered in games and high tech gadgets that are not only played by children, but parents as well --- whether online, or with handheld gadgets and cellular phones. In an effort to revive the games among adults (whether they have played it before or not), Magna Kultura created in-roads among local Filipino corporations to use the Filipino games as a team-building activity platform for their sports fest. Magna Kultura believes that once adults get to play the games, they will surely teach it to their children. The effort makes the Human Resource Department's staff in companies fellow-advocates in reviving the Games of our Heritage. 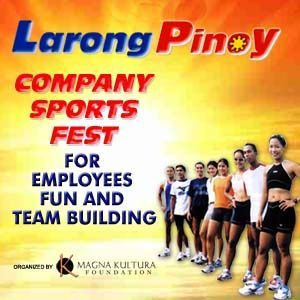 Since Y2009, over a thousand companies and organizations have conducted Larong Pinoy as platform for their company sports fest. Yes! Patintero, Tumbang Preso, Luksong Tinik, Luksong Lubid, and other Filipino traditional games --- used in a tournament format. The games are as challenging as any Western sports or Olympic game. And best of all, it ushers true bonding-camaraderie among employees, as everybody played like childhood mates. Since 2009, Filipino companies started looking for a new way of conducting corporate sports fests. Seeking for other games, aside from the usual basketball, volleyball or track & field activities, Human Resource managers saw Larong Pinoy as a subtle, yet fun, platform for bonding employee camaraderie. It is a game everybody knows --- young and old. It is a game that anyone can play with a youthful spirit. It has the ability to bond fellow-employees, and build relationships that makes each one like real “kababata’s”. Office-mates transform into childhood playmates --- making internal relationships light and easy after the event. Human Resource Manager’s says that a team-building is more than just dragging employees to the usual basketball intramurals or having someone give them a lecture on why it’s important to work together. People learn best when they’re moving around, interacting, and working together on fun challenges. They perceived that there's more than one way to improve the level of employee engagement in a company. And the use of Larong Pinoy became a unique platform to engage employees, as it creates a youthful energy and fun community atmosphere at the workplace. News about Larong Pinoy as sports fest triggers sharing of personal experiences and insights that actually leads to intimate bonding. Even top management boasts among younger employees that it was their game. It's a different kind of fun. It engages employees with a unique sporting experience (definitely different from the usual basketball or track racing). In all types of games, everyone can play --- young our old, line or staff. And, even non-players have the fun simply watching co-employees execute and compete in the games. 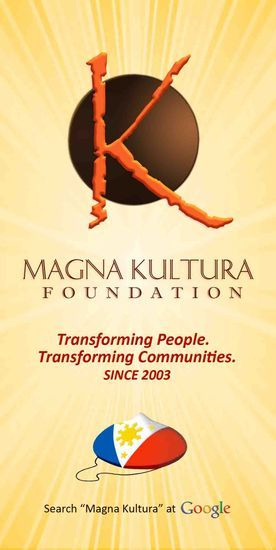 Since Y-2009, Magna Kultura Foundation, the chief advocate of the Philippine Traditional Games, expanded its reach among private corporations to promote the games of our heritage among adults. The Foundation has been conducting Larong Pinoy Sports Clinics and tournaments in schools and barangays, reviving the games among the new generation of Filipino youths. The outreach among local companies is an effort to revive the games among adults who knew the games in their childhood. For many, it’s a “homecoming”. Thus, on top of conducting Larong Pinoy in schools and barangays, Magna Kukltura is advocating the games among companies, to revive it among adults --- so that parents could teach the games to their children. 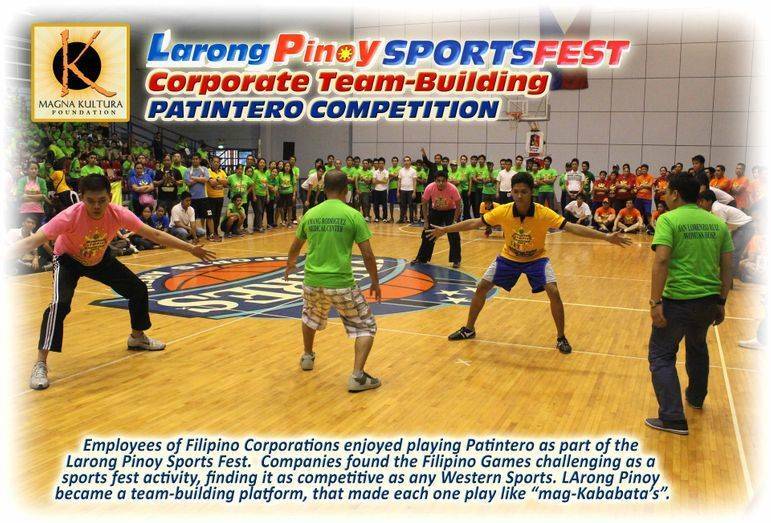 Among the companies that conducted teambuilding sporstfest using Larong Pinoy were: Asian Development Bank (ADB), Panasonic, Viva Entertainment, Red Ribbon Bakeshop, UCPB, Gardenia Breads, Havaianas, Chevron, Mead Johnson, Nissan Motors, Cherry Mobile, DHL, Rustan’s, Brother Printers, Accenture, Torm Shipping, Colliers Phils., Punongbayan & Araullo, and many others. The Department of Health used the games as a mini-Olympics among 21 NCR government hospitals. Gardenia Bakeries Phils used Larong Pinoy as a team-bonding among their suppliers and service providers. Manulife used it to celebrate their partnership anniversary with Chinabank. 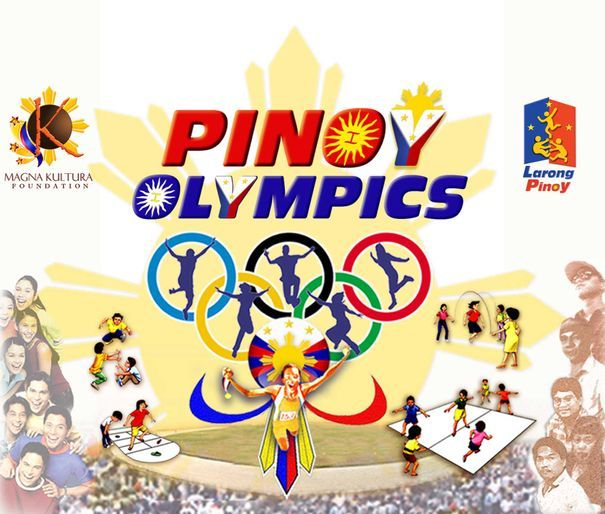 And many other companies used Larong Pinoy Olympics as sports fest with their clients and suppliers. Larong Pinoy sports Fest made company affairs colorful and fun. Line and staff, executives and clerks, join the fun and excitement like childhood playmates. Employees who seldom greet each other at the office got to know each and everyone in a congenial way. With Larong Pinoy, even young companies with new employees add heritage and legacy using the traditional games. 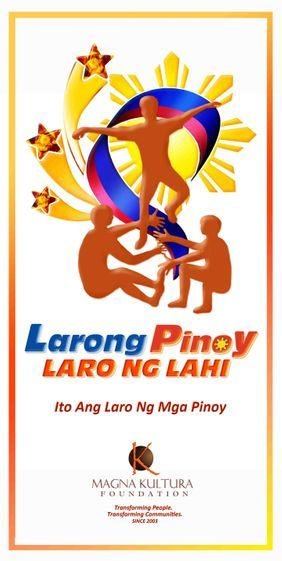 The Larong Pinoy experience is brought into an entirely new level, with professional sports organizing. From planning to implementation, Magna Kultura executes everything with a Tournament Systems & Procedures manual, with Referees and Game Marshals, the Emcee announcement. Magna Kultura provides the Game Materials, Registration Forms, the Program Scripts, and everything that makes for an Olympic-like event. Sports committees members and HRD staff can sit back, relax, and just play with the rest of their colleagues on the day of the event. Larong Pinoy Sports Fest can be held anytime of the year, and only requires the space of a basketball court. Schools and companies conduct the games at a covered court, where everybody can sit-back and enjoy watching the games. Everything Old is New again. And the Filipino spirit lives on. Anybody who played Larong Pinoy will never forget the experience, and never forget the people they played with. This is the Games of our Heritage. DICKIE AGUADO, Executive Director - MAGNA KULTURA FOUNDATION at Tel. Nos. : 514-5868 or Mobile Nos: 0917-8990025 or 0922-8990026. Organizing Larong Pinoy Sports Fest for Private companies is among the cultural entrepreneurship approaches of Magna Kultura to raise funds for the socio-civic programs of the foundation; at the same time, once more reviving the games of our heritage ("Laro ng Lahi") back in the mainstream of Philippine society.